SUBARU FORESTER SUV (2002 - 2008 MODEL). ANY COMPATIBILITY GIVEN SHOULD BE USED AS A VERY GOOD GUIDE 'ONLY.'. We will do our utmost to avoid this from happening. OTHER CONSIDERATIONS. These actions will facilitate a speedy and efficient response to any queries and we regret that any claims outside of this procedure will NOT be accepted by us. USED CONDITION. MARKS AS PER PICTURES. Subaru Impreza Drivers Side Door Card 2008-2013. Removed from a 2010 Impreza 2.0 boxer diesel RC model. Will fit other models around the same year. In overall great condition. Has a leather arm rest section next to the the window switch panel area. To Fit : Subaru Forester 97-02. CURRENTLY BREAKING Subaru Forester Turbo S 2001 87K Miles. Here we have a rear door card. Passenger Side. FORESTER - RHD. Vehicle Colour R Front Door. Compatibility is a guide only. D XC 2.0 Diesel 6 Speed Manual. Trim Level Other Details Number Of Doors. The lower portion of the panel is light grey with a dark grey upper section inc the pull handle armrest piece and the material section at the top is grey with a diamond pattern. From a 2005 Subaru Legacy 2.0R EJ204 MK4 Gen4, Automatic Transmission. Based in Halifax, West Yorkshire, we will do all we can to ensure you get the OEM parts you want, at an unbeatable price. We also promise to do all we can when you encounter problems; all you have to do is to ensure that you are buying the correct part from us. THIS DOORCARD IS IN GOOD CONDITION. THIS PART IS FROM A 2008 SUBARU LEGACY 2.0 DIESEL, 5 DOOR ESTATE, 5 SPEED MANUAL GEARBOX. JDS REF - 066. Land Rover. OUR REF: REF 00000066. FITS:LEGACY 2004 -2009 Mk4 Rear Left. A genuine honest guy who is as passionate about your car as you are. Have had lots of work done by Richard inc. engine work and is a top bloke who doesn't cost the earth. © East Kent Subaru Spares 2018. REMOVE FROM SUBARU FORESTER XS NAVPLUS 2.0 DIESEL,2009 YEAR,150 BHP,6 SPEED MANUAL GEARBOX TY756W1ZAB,ENGINE CODE EE20ZLDYLE,PAINT CODE 64Z BLUE. MY AIM IS TO MAKE SURE YOU ARE ALWAYS 100% HAPPY! FORESTER - RHD. Vehicle Colour Trim Level R Rear Door. Number Of Doors. © East Kent Subaru Spares 2018. A genuine honest guy who is as passionate about your car as you are. Have had lots of work done by Richard inc. engine work and is a top bloke who doesn't cost the earth. To Fit : Subaru Forester 97-02 All Models. CURRENTLY BREAKING Subaru Forester Turbo S 2001 87K Miles. Part Number : Subaru. Front Passenger / Left Side. Here we have a door card. Subaru Impreza Passenger Side Door Card 2008-2013. Removed from a 2010 Impreza 2.0 boxer diesel RC model. Will fit other models around the same year. In overall great condition. Has a leather arm rest section next to the the window switch panel area which has been repaired on the plastic section underneath as shown in the last picture. This part was removed from a Right Hand Drive Vehicle. Compatibility is a guide only. Your item will need to be signed for. Door Panel. TRIM LEVEL. D XC 2.0 Diesel 6 Speed Manual. Part Number. 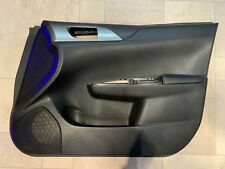 1998-2002 Subaru Forester (SF) offside/right hand side door card.As picture. Subaru Impreza GC8 non Turbo 2.0 1998-2001. Subaru Impreza GC8 sport V4-V6 style driver side right rear doorcard. All we ask is that you give us a chance to resolve it this way first as it draws a much quicker close to the matter which is always good. Subaru Impreza GC8 non Turbo 2.0 1998-2001. Subaru Impreza GC8 sport V4-V6 style passenger side left front doorcard. We are a car dismantling facility based in west wales not far from the coastal town of Newquay. As picture. Pictured part(s) are the actual part(s) you will receive unless noted otherwise. Subaru Impreza WRX STI Turbo newage 2.02005 Blobeye. Fits 2001-2007 newage imprezas. Driver side right front interior doorcard in good used condition as pictured / Genuine subaru part. Colour code: Black. THIS DOORCARD IS IN GOOD CONDITION. THIS PART IS FROM A 2008 SUBARU LEGACY 2.0 DIESEL, 5 DOOR ESTATE, 5 SPEED MANUAL GEARBOX. JDS REF - 066. Land Rover. OUR REF: REF 00000066. FITS:LEGACY 2004 -2009 Mk4 Front Left. THIS DOORCARD HAS A FEW SCRATCHES. THIS PART IS FROM A 2008 SUBARU LEGACY 2.0 DIESEL, 5 DOOR ESTATE, 5 SPEED MANUAL GEARBOX. JDS REF - 066. Land Rover. OUR REF: REF 00000066. FITS:LEGACY 2004 -2009 Mk4 Front Right. 2007 SUBARU IMPREZA. IMPREZA 2000 -2007 Rear Right. Our site is spread over 5 acres consisting of a reception area, two large storage buildings, de-pollutions bay, vehicle racking facility, in house crushing/bailing zone. 2007 SUBARU IMPREZA. IMPREZA 2000 -2007 Rear Left. Our site is spread over 5 acres consisting of a reception area, two large storage buildings, de-pollutions bay, vehicle racking facility, in house crushing/bailing zone. THIS PART IS FROM A 2001 SUBARU LEGACY OUTBACK H6 3.0 AUTOMATIC, 5 DOOR ESTATE. FITS:OUTBACK 1998 -2003 Mk2 Front Right. Land Rover. OUR REF: REF 00000364. THIS IS A BARE DOOR CARD. Any item or invoice marked 'Sold as Seen' will invalidate this warranty. 2007 SUBARU IMPREZA. IMPREZA 2000 -2007 Front Left. Our site is spread over 5 acres consisting of a reception area, two large storage buildings, de-pollutions bay, vehicle racking facility, in house crushing/bailing zone. THIS PART IS FROM A 2001 SUBARU LEGACY OUTBACK H6 3.0 AUTOMATIC, 5 DOOR ESTATE. FITS:OUTBACK 1998 -2003 Mk2 Rear Right. OUR REF: REF 00000364. Any item or invoice marked 'Sold as Seen' will invalidate this warranty. Subaru Impreza GC8 non Turbo 2.0 1998-2001. Subaru Impreza GC8 sport V4-V6 style passenger side left rear doorcard. We are a car dismantling facility based in west wales not far from the coastal town of Newquay. THIS PART IS FROM A 2001 SUBARU LEGACY OUTBACK H6 3.0 AUTOMATIC, 5 DOOR ESTATE. FITS:OUTBACK 1998 -2003 Mk2 Front Left. Land Rover. OUR REF: REF 00000364. THIS IS A BARE DOOR CARD. Any item or invoice marked 'Sold as Seen' will invalidate this warranty. This part was removed from a Right Hand Drive Vehicle. Compatibility is a guide only. Your item will need to be signed for. Left Front - In good working order. TRIM LEVEL. Other Details. D XC 2.0 Diesel 6 Speed Manual. 2007 SUBARU IMPREZA. IMPREZA 2000 -2007 Front Right. Our site is spread over 5 acres consisting of a reception area, two large storage buildings, de-pollutions bay, vehicle racking facility, in house crushing/bailing zone. Removed from a facelift 2001 model but Fits first generation forester from 1997-2002. We are a car dismantling facility based in west wales not far from the coastal town of Newquay. All we ask is that you give us a chance to resolve it this way first as it draws a much quicker close to the matter which is always good. THIS PART IS FROM A 2001 SUBARU LEGACY OUTBACK H6 3.0 AUTOMATIC, 5 DOOR ESTATE. FITS:OUTBACK 1998 -2003 Mk2 Rear Left. Land Rover. OUR REF: REF 00000364. Any item or invoice marked 'Sold as Seen' will invalidate this warranty. MK1 Facelift 2.0 Petrol 5 Sped. FORESTER - RHD. Vehicle Colour Trim Level R Front Door. Number Of Doors.